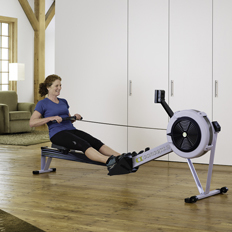 With three models to choose from, you can select the indoor rower that best meets your needs and preferences. To help you choose, have a look at the usage scenarios below or view a side-by-side comparison. Regardless of which Concept2 Indoor Rower you choose, you’ll get a great workout! The Model D is our best-selling machine. This is our most affordable option and provides everything you need for a great workout at home. The Model D is most familiar to on water rowers who are looking for the same workout as in most boathouses. The Model D is the standard for indoor rowing competitions or submitting scores for recruiting. The Model E is a good choice if you would like a machine with a higher seat height, or if you prefer the appearance of the Model E.
The increased seat height of the Model E also makes it easier to get on and off the machine, especially if you have limited mobility or flexibility with your knees or hips, if you have difficulty with balance, or if you’ll be getting on the machine from a wheelchair. 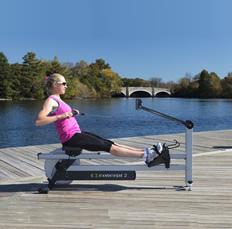 If you are accustomed to rowing on the Model D or E, you will notice several differences when you switch to the Dynamic. Most noticeably, your feet do the sliding. The seat is essentially stationary. This helps make the physics and feel of rowing on the Dynamic much more like a lightweight boat. Also, there is less return force in the handle pulling you back up to the catch. This shifts more control of the stroke length and coordination to the user, as is the case in a rowing shell. If you are training at home to row or race on the water, consider the Dynamic. Although the Model D and E have a larger footprint than the Dynamic (96 in/244 cm versus 76 in/193 cm), they separate in the middle for storage—important to consider if you want to store the machine between workouts. The Model D is well-suited for rowing clubs and teams, many of which typically have a number of Model Ds already. 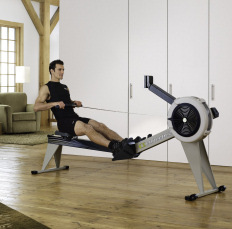 The lower price also makes it possible to purchase more indoor rowers. 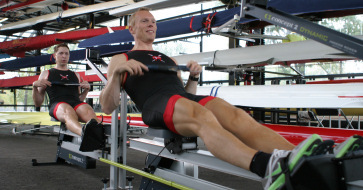 The Dynamic Indoor Rower, introduced in December 2010, is another option for rowing teams to consider. The Dynamic was designed to be more similar to rowing on the water and promotes good rowing habits. Two or more Dynamics can easily be linked together for training timing of movements within a team boat. For team training, the Model D and Model E can also be connected via Slides (sold separately). For fitness facilities and other high-use, multiple-user environments, we recommend the Model E. The additional height for improved accessibility and visibility, along with the extra ruggedness, all contribute to make the Model E the model of choice for these applications. 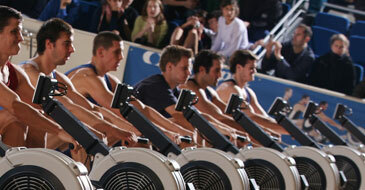 Many schools opt for the affordability of the Model D, so that there is a sufficient student-to-indoor rower ratio. The PM5 allows teachers to set up machines for racing. Kids love it! Power Requirement Takes two D cell batteries. During your workout, the monitor draws power from the spinning flywheel to extend battery life. Takes two D cell batteries. During your workout, the monitor draws power from the spinning flywheel to extend battery life. Takes two D cell batteries. During your workout, the monitor draws power from the spinning flywheel to extend battery life. Monitor Arm ABS plastic. Pivots for storage and to adjust monitor height. Monitor angle can also be adjusted. Fixed monitor arm made of aluminum. Monitor angle can be adjusted. Aluminum. Pivots for storage and to adjust monitor height. Monitor angle can also be adjusted.